As soon as the snow melts from Colorado’s ski resorts and exposes the trail systems that were buried for months, mountain bikers get a certain gleam in their eyes — time for a gear tune-up and the thrill of those first, fresh rides of the summer season. Conveniently, the same gondolas and chairlifts that whisk skiers up the mountains in winter avail themselves to cyclists and their bikes all summer long, so riders can gain altitude fast and discover the thrill of bombing down singletrack, cross-country and technical trails all summer long. Sound fun? Here’s where to find a ride to suit your experience level at major ski areas-turned-biking havens across Colorado. Debatably one of the birthplaces of mountain biking, it’s no exaggeration to label Crested Butte as a must-ride destination. Cycle culture is everywhere: You’ll see fleets of townies cruising through downtown and pickup trucks stacked high with dust-covered downhill rigs. From where are these mountain bikers returning? Quite possibly the epic 401 Trail Loop, a dream trail for many an alpine biker. Or they might have been to the ski area’s Evolution Bike Park, boasting more than 30 miles of both smooth and technical routes, and everything in between. And as Colorado’s wildflower paradise, it’s also one of the prettiest places to bike, with Indian paintbrush, lupine and daisies lining the trails in mid-summer. Just utter the word “Trestle” to mountain bikers worldwide, and they will smile knowingly. The park is legendary for its namesake wooden trestles and an enviable pro design by Gravity Logic (the folks also responsible for Whistler Mountain Bike Park in British Columbia). While Trestle is just 20 or so miles away from Bike Granby Ranch, the trails here are notably more manicured. Yet there’s a bit of something for everyone, from the beginner- and kid-friendly Green Horn-It! to the gnarly leaps on double-black diamond Cruel and Unusual. There’s even a pro section, called Banana Peel, accessible only with a separate pass. If you’re new to the sport or want to improve your skills, the Trestle Bike Park School has lessons at all levels. More than 50 trails crisscross the storied Keystone Bike Park. And they’re filled with handlebar-gripping rock gardens, jumps, free falls and manmade wooden features. One of the more rugged parks around, it is a go-to spot for progressive downhill riders. The latest talk is about Holy Diver, an old logging trail that the resort has turned into a jump line with six berms and a huge wooden ramp, and the Drop Zone skill park. If we haven’t scared you off yet, good! There also happen to be more than 100 miles of singletrack for touring, plus gentle beginner trails for easy riding. 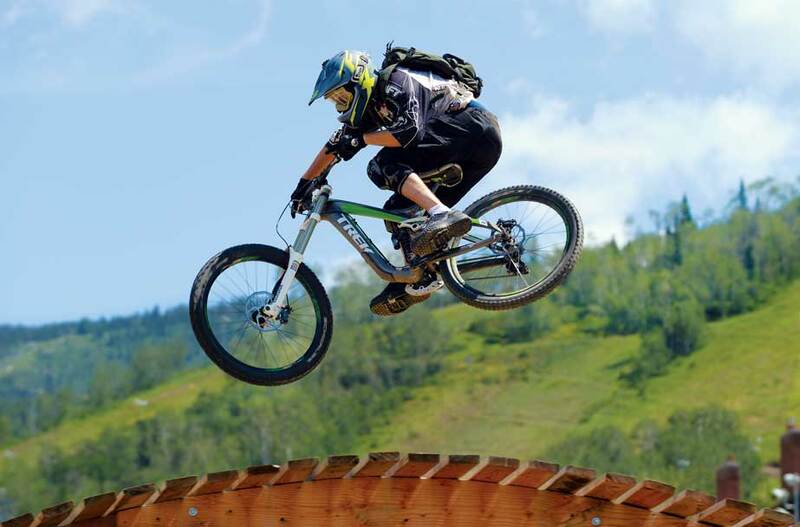 Once known solely for its placid cross-country riding, Steamboat Bike Park has upped the ante in recent years, greatly expanding its downhill terrain with 2,200 vertical feet of lift-served trails. Take a relatively easy cruise down Tenderfoot’s 3 miles, or tackle the rollers, berms and drops at the park’s most popular blue trail, Rustler’s Ride. The cherry on top? A day of thigh-burning action can be soothed away by a dip in the steaming mineral waters at Strawberry Park Hot Springs. True versatility is the name of the game at Snowmass. Meander through meadows on 50 miles of classic cross-country trails or find your new favorite gravity ride, with terrain stretching all the way from the top of Elk Camp Chairlift back down to Snowmass Village (that’s 2,897 vertical feet, if you’re counting). Newbies and youngsters can practice their technique at the skills park, glide over the Verde Trail or let a Bike Pro guide show you the way. Those looking for a more heart-pumping thrill can swivel, jump and hop through the Viking, Vapor and Valhalla trails. As wildly popular as the Durango area is for mountain biking, it might surprise you to learn that the local ski area, Purgatory Mountain Resort, lacked a lift-served bike trail until 2015. No matter, Divinity Flow Trail has made up for lost time and is now Durango’s longest downhill flow trail, a 1.5-mile ride with optional tabletops, berms, hits, bridges and wall-rides — making it suitable for most intermediate to advanced riders. Or choose from 11 other runs of varying levels that zoom through spruce and aspen forests (and the occasional grazing deer or wandering elk). 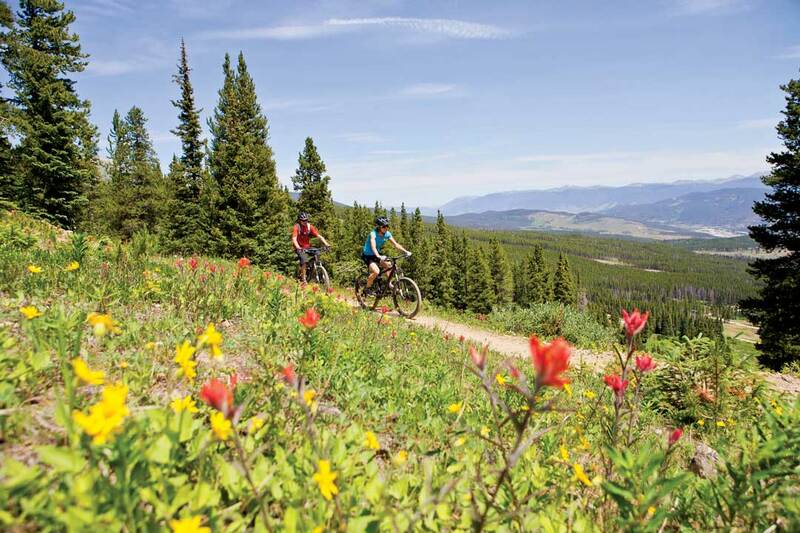 Wind through stands of shimmering aspen and fragrant ponderosa pines, take in sweeping views of the Gore Mountain Range and end up with perma-grin as you ride Vail Mountain’s network of MTB trails. While Vail’s mountain-biking system is less progressive than others, this is a boon for riders who simply want to cruise soft singletrack through forest and prairie. That’s just what you’ll get on the Grand Traverse trail, which enjoys views of Mt. of the Holy Cross and dips into the resort’s three back bowls. Freeriders will love Magic Forest, with more technical features, wooded sections and challenging drop-offs. We’ve heard it said that the town of Breckenridge is “one big trailhead,” and we’d have to agree. There are miles of buzzed-about trails heading up from town, including the popular Middle Flume loop, which kicks off with a lung-busting climb and rewards you with a breezy descent at the end. Plenty of lift-served trails await on Breck’s ski mountain as well. Load your bike onto the Colorado SuperChair at the base of Peak 8 and give it a go on Whirl trail, a short intro for still-learning riders, or tackle Dwight’s, a winding route with rocky descents and narrow zips through the forest. The relaxed vibe that makes Copper Mountain a family-favorite ski destination persists in summer with the resort’s low-key mountain-biking program. This trail network is served by the American Eagle lift, which brings riders and their bikes up for a great beginner’s experience or more challenging singletrack trails for advanced riders. Jonesing for an extra workout? Wide service roads provide access for anyone who prefers to ride uphill after hours. Majestic mountain panoramas and adrenaline-pumping trail rides are all yours for free, thanks to Telluride’s complimentary gondola service to the Mountain Village Bike Park. You’ll have to sign a liability waiver, but after that, miles of epic, well-maintained downhill lines are yours for the taking. With two blue trails and three blacks, this mountain is best saved for experienced riders. Let ’er rip down the smooth, curvy and deliciously long No-Brainer trail, or test yourself on Pan-Coaster, with berms and jumps weaving in and out of the forest. If you’re new to mountain biking at ski resorts, you’ll notice that trail maps have the same basic difficulty designations that ski runs do: green is easiest, blue is more difficult, black is most difficult (you’ll see riders in full-face helmets and armored padding) and black diamonds are expert-only trails. Help protect the lands that make mountain biking in Colorado so spectacular. Please stay on the trail, never approach wildlife, respect trail closures and pack out every tiny bit of trash you bring in (food wrappers, toilet paper, drink bottles, etc.). To find volunteer opportunities in areas you plan to visit, download the YourCo app.